Itch has web player version (use firefox!) and also has downloads of my game for windows, mac and linux. Last year’s game (synthesizer) is up there on the same account if you poke about. Readme.txt in zip of windows download only, sorry, forgot to add it to mac and linux so reproduced below. Let’s Pango by pango: (has basically all the info about how the game works, so you may not want to watch it if you like to be unspoiled; game is still challenging when you know everything). movement is skating and a bit weird and rotationallllllly. 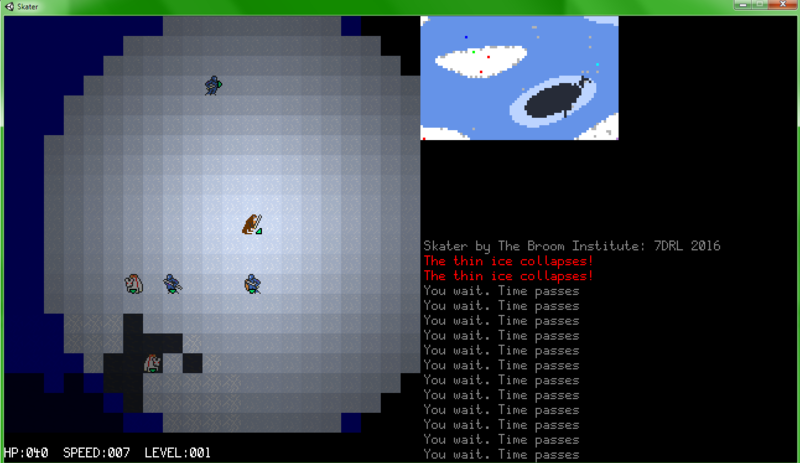 and mob vs. mob combat uses speed. to get off each level find the warp beads then head to the warp gate! All that’s new is title screen, lanterns outside buildings. Still no skating! Today I was supposed to get map gen finished but I didn’t. The game looks like it’s doing well but it’s mainly because I’m using an engine prototype I developed before last year’s 7DRL so I have a lot of code in it. Here’s a screenshot: I’m using coherent noise to divide the world up into water, thin ice, ice and snow, then various techniques to place objects on the map. Lights are semi-ugly but I don’t have the time to mess around with them too much. I put off starting my game almost to the last minute where I could still get the full week: I’m scared of failure and the pressure gets to me somewhat. I do enjoy it though. So day 1 ends and I have made 129 16×16 sprites. After a false start where I was outlining everything in dark grey I settled on only outlining a few things: 16×16 is too small to outline everything as the lines are so thick. Some of the sprites I’m proud of, some I’m ashamed of and may re-do, most are average to decent.